Recently, a number of researches related to underwater vehicle has been conducted worldwide with the huge demand in different applications. In this paper, we propose visual servoing for underwater vehicle using dual-eyes cameras. A new method of pose estimation scheme that is based on 3D model-based recognition is proposed for real-time pose tracking to be applied in Autonomous Underwater Vehicle (AUV). In this method, we use 3D marker as a passive target that is simple but enough rich of information. 1-step Genetic Algorithm (GA) is utilized in searching process of pose in term of optimization, because of its effectiveness, simplicity and promising performance of recursive evaluation, for real-time pose tracking performance. 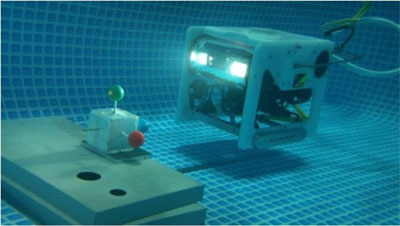 The proposed system is implemented as software implementation and Remotely Operated Vehicle (ROV) is used as a test-bed. In simulated experiment, the ROV recognizes the target, estimates the relative pose of vehicle with respect to the target and controls the vehicle to be regulated in desired pose. PID control concept is adapted for proper regulation function. Finally, the robustness of the proposed system is verified in the case when there is physical disturbance and in the case when the target object is partially occluded. Experiments are conducted in indoor pool. 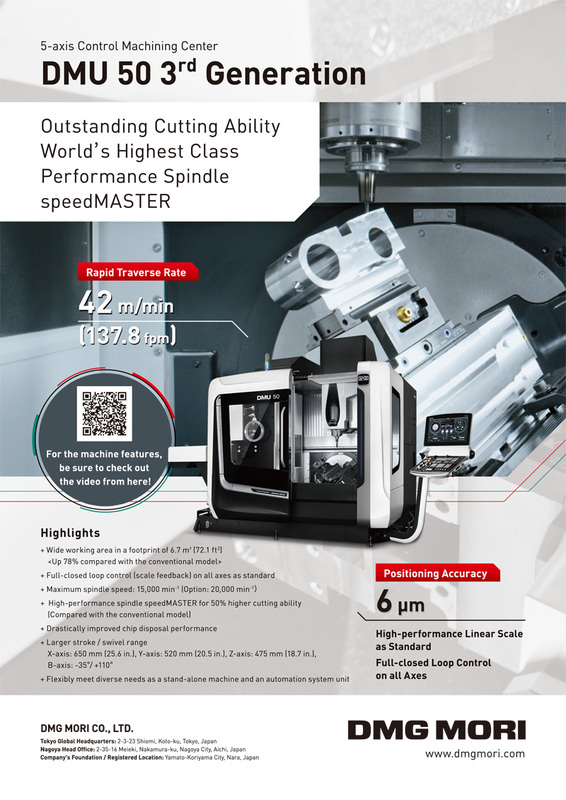 Experimental results show recognition accuracy and regulating performance with errors kept in centimeter level. M. Myint, K. Yonemori, A. Yanou, K. Lwin, M. Minami, and S. Ishiyama, “Visual Servoing for Underwater Vehicle Using Dual-Eyes Evolutionary Real-Time Pose Tracking,” J. Robot. Mechatron., Vol.28, No.4, pp. 543-558, 2016. F. Chaumette and S. Hutchinson, “Visual servo control I: Basic approaches,” IEEE Robot. Autom. Mag., Vol.13, No.4, pp. 82-90, Dec. 2006. F. Chaumette and S. Hutchinson, “Visual servo control II: Advanced approaches,” IEEE Robot. Autom. Mag., Vol.14, No.1, pp. 109-118, Mar. 2007. F. Janabi-Sharifi, L. Deng, and W. J. Wilson, “Comparison of basic visual servoing methods,” IEEE/ASME Trans. on Mechatronics, Vol.16, No.5, October 2011. Y. Okuda, H. Kamada, S. Takahashi, S. Kaneko, K. Kawabata, and F. Takemura, “Method of dynamic image processing for ecology observation of marine life,” J. of Robotics and Mechatronics, Vol.25, No.5, pp. 820-829, 2013. D. Lee, X. Tao, H. Cho, and Y. Cho, “A dual imaging system for flip-chip alignment using visual servoing,” J. of Robotics and Mechatronics, Vol.18, No.6, pp. 779-786, 2006. G. L. Foresti, S. Gentili, and M. Zampato, “A vision-based system for autonomous underwater vehicle navigation,” OCEANS ’98 Conf. Proc. (Vol.1), pp. 195-199, 1998. J.-Y. Park, B.-H. Jun, P.-M. Lee, and J. Oh, “Experiments on vision guided docking of an autonomous underwater vehicle using one camera,” Ocean Eng., Vol.36, No.1, pp. 48-61, Jan. 2009. T. Ura, Y. Kurimoto, H. Kondo, Y. Nose, T. Sakamaki, and Y. Kuroda, “Observation behavior of an AUV for ship wreck investigation,” Proc. of the OCEANS 2005 MTS/IEEE Conf., Vol.3, pp. 2686-2691, 2005. N. Palomeras, P. Ridao, D. Ribas, and G. Vallicrosa, “Autonomous I-AUV docking for fixed-base manipulation,” Preprints of the Int. Federation of Automatic Control, pp. 12160-12165, 2014. S. Sagara, R. B. Ambar, and F. Takemura, “A stereo vision system for underwater vehicle-manipulator systems – proposal of a novel concept using pan-tilt-slide cameras –,” J. of Robotics and Mechatronics, Vol.25, No.5, pp. 785-794, 2013. Y. Li, Y. Jiang, J. Cao, B. Wang, and Y. Li, “AUV docking experiments based on vision positioning using two cameras,” Ocean Engineering, Vol.110, pp. 163-173, December 2015. F. Maire, D. Prasser, M. Dunbabin, and M. Dawson, “A vision based target detection system for docking of an autonomous underwater vehicle,” Australasian Conf. on Robotics and Automation (ACRA), Sydney, Australia, December 2-4, 2009. S. Ishibashi, “The stereo vision system for an underwater vehicle,” Oceans 2009, Europe, Bremen, pp. 1343-1348, 2009. S. Cowen, S. Briest, and J. Dombrowski, “Underwater docking of autonomous undersea vehicle using optical terminal guidance,” Proc. IEEE Oceans Engineering, Vol.2, pp. 1143-1147, 1997. K. Teo, B. Goh, and O. K. Chai, “Fuzzy docking guidance using augmented navigation system on an AUV,” IEEE J. of Oceans Engineering, Vol.37, No.2, April 2015. M. D. Feezor, F. Y. Sorrell, P. R. Blankinship, and J. G. Bellingham, “Autonomous underwater vehicle homing/docking via electromagnetic guidance,” IEEE J. of Oceans Engineering, Vol.26, No.4, pp. 515-521, October 2001. R. S. McEwen, B. W. Hobson, L. McBride, and J. G. Bellingham, “Docking Control System for a 54-cm-Diameter (21-in) AUV,” IEEE J. of Oceanic Engineering, Vol.33, No.4, pp. 550-562, October 2008. K. Teo, E. An, and P.-P. J. Beaujean, “A robust fuzzy autonomous underwater vehicle (AUV) docking approach for unknown current disturbances,” IEEE J. of Oceanic Engineering, Vol.37, No.2, pp. 143-155, April 2012. J.-Y. Park , B.-H. Jun, P.-M. Lee, F.-Y. Lee, and J.-h. Oh, “Experiment on underwater docking of an autonomous underwater vehicle ‘ISiMI’ using optical terminal guidance,” IEEE Oceanic Engineering, Europe, pp. 1-6, 2007. A. Negre, C. Pradalier, and M. Dunbabin, “Robust vision-based underwater homing using self similar landmarks,” J. of Field Robotics, Wiley-Blackwell, Special Issue on Field and Service Robotics, Vol.25, No.6-7, pp. 360-377, 2008. M. Dunbabin, B. Lang, and B. Wood, “Vision-based docking using an autonomous surface vehicle,” IEEE Int. Conf. on Robotics and Automation, Pasadena, CA, USA, 2008. P. Batista, C. Silvestre, and P. Oliveira, “A two-step control strategy for docking of autonomous underwater vehicles,” American Control Conf., Fairmont Queen Elizabeth, Montréal, Canada, 2012. N. Palomeras, A. Peñalver, M. Massot-Campos, G. Vallicrosa, P. L. Negre, J. J. Fernández, P. Ridao, P. J. Sanz, G. Oliver-Codina, and A. Palomer, “I-AUV docking and intervention in a subsea panel,” IEEE/RSJ Int. Conf. on Intelligent Robots and Systems, Chicago, IL, pp 2279-2285, 2014. S.-C. Yu, T. Ura, T. Fujii, and H. Kondo, “Navigation of autonomous underwater vehicles based on artificial underwater landmarks,” OCEANS MTS/IEEE Conf. and Exhibition, Vol.1, pp. 409-416, 2001. L. Vacchetti and V. Lepetit, “Stable real-time 3D tracking using online and offline information,” Trans. on Pattern Analysis and machine Intelligence, Vol.26, No.10, pp. 1385-1391, 2004. C. Choi, S.-M. Baek, and S. Lee, “Real-time 3D object pose estimation and tracking for natural landmark based visual servo,” IEEE/RSJ Int. Conf. on Intelligent Robots and Systems, pp. 3983-3989, 2008. N. P. Papanikilopoulos, P. K. Khosla, and T. Kanade, “Visual tracking of a moving target by a camera mounted on a robot: a combination of control and vision,” IEEE Trans. on Robotics and Automation, Vol.9, No.1, pp. 14-35, Feb. 1993. G. Panin and A. Knoll, “Fully automatic real-time 3D object tracking using active contour and appearance models,” J. of Multimedia, Vol.1, No.7, pp. 62-70, 2006. H. Hajimolahoseini, R. Amirfattahi, and S. Khorshidi, “Real-time pose estimation and tracking of rigid objects in 3D space using extended Kalman filter,” 22nd Iranian Conf. on Electrical Engineering (ICEE), pp. 1545-1549, 2014. W. Song, M. Minami, and S. Aoyagi, “Feedforward on-line pose evolutionary recognition based on quaternion,” J. of the Robot Society of Japan, Vol.28, No.1, pp. 55-64, 2010 (in Japanese). W. Song and M. Minami, “On-line motion-feedforward pose recognition invariant for dynamic hand-eye motion,” IEEE/ASME Int. Conf. on Advanced Intelligent Mechatronics, pp. 1047-1052, 2008. W. Song and M. Minami, “Stability/precision improvement of 6-DoF visual servoing by motion feedforward compensation and experimental evaluation,” IEEE Int. Conf. on Robotics and Automation, pp. 722-729, 2009. W. Song and M. Minami, “Hand and eye-vergence dual visual servoing to enhance observability and stability,” IEEE Int. Conf. on Robotics and Automation, pp. 714-721, 2009. W. Song and M. Minami, “3-D visual servoing using feedforward evolutionary recognition,” J. of the Robot Society of Japan, Vol.28, No.5, pp. 591-598, 2010 (in Japanese). F. Yu, M. Minami, W. Song, J. Zhu, and A. Yanou, “On-line head pose estimation with binocular hand-eye robot based on evolutionary model-based matching,” J. of Computer and Information Technology, Vol.2, No.1, pp. 43-54, 2012. W. Song, M. Minami, F. Yu, Y. Zhang, and A. Yanou, “3-D hand and eye-vergence approaching visual servoing with Lyapunov-stable pose tracking,” IEEE Int. Conf. on Robotics and Automation (ICRA), pp. 5210-5217, 2011. H. Suzuki and M. Minami, “Visual servoing to catch fish using global/local GA search,” IEEE/ASME Trans. on Mechatronics, Vol.10, Issue 3, pp. 352-357, 2005.